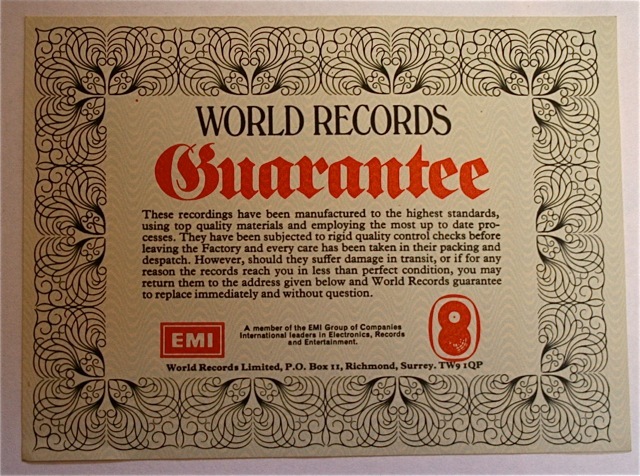 It was compiled and sold by World Records, EMI’s mail order division. 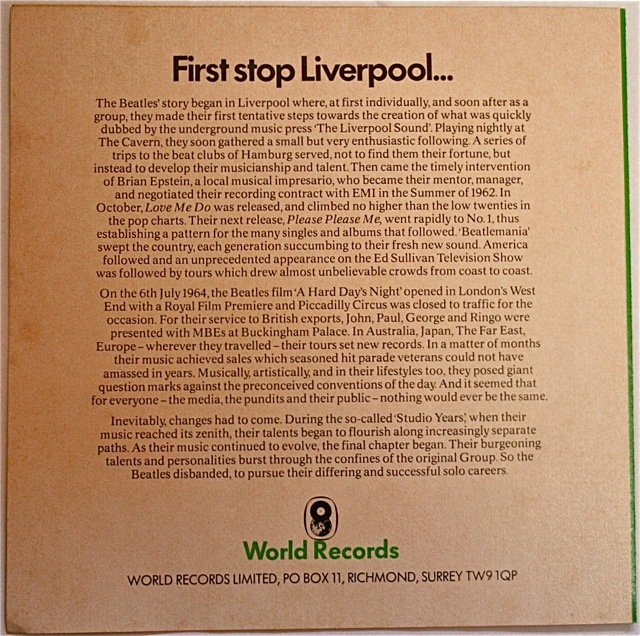 It was never commercially released to stores – the only way you could get it was through ordering it via World Records. 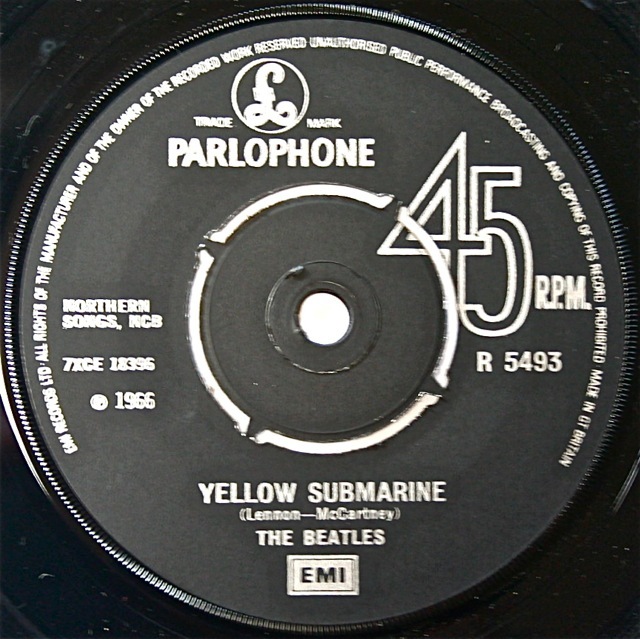 The earlier titles are pressed on the EMI/Parlophone label while the later discs are on the Apple Records label. 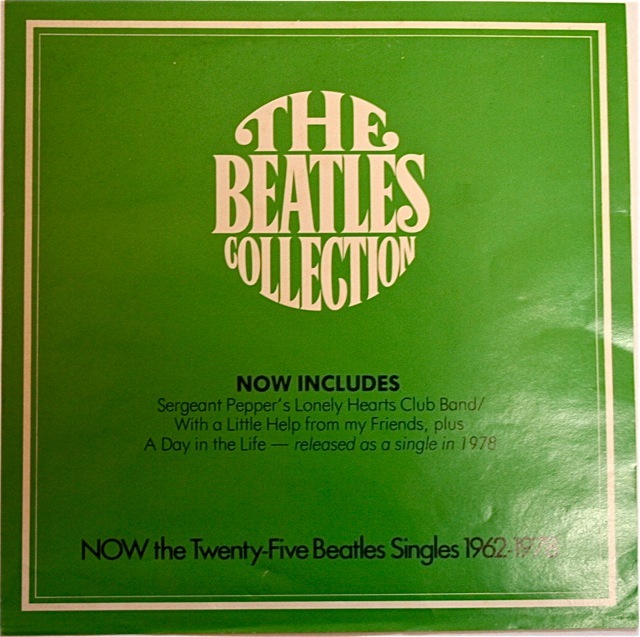 This entry was posted in Apple Records, Beatles, Beatles Collecting, Beatles Music and tagged Apple Records, Beatles, Beatles Box Sets, Beatles Collecting, Music, Sgt. 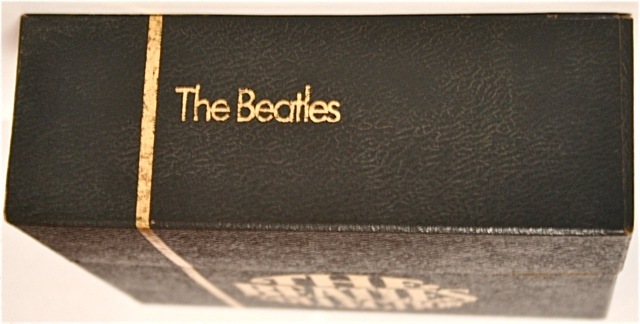 Pepper, Vinyl box set by beatlesblogger. Bookmark the permalink. I’m a label variation fanatic and i find your collecttion mesmerizing to say the least. My biggest amount of varaitions are for the White album…I have ten in all. i don’t know what to add other than I loved looking at the phostos of your collectioon. pete. Hi Peter – thanks for that – glad you enjoy the blog. 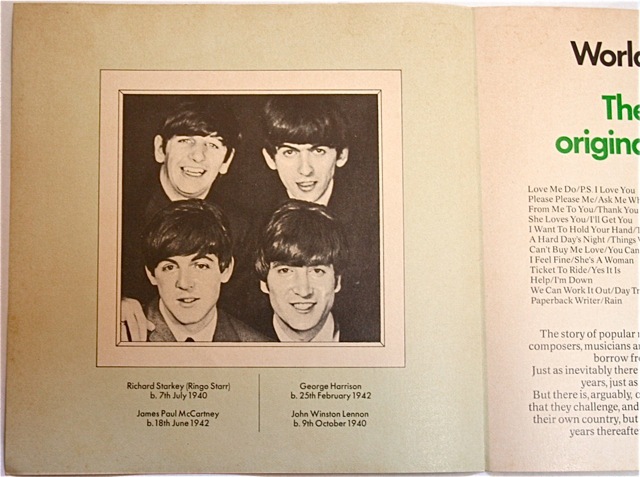 I like the sound of your White Album label variations. If you get the time you could either take photos or scans of each, email them to me, and we can publish a page of variations of that album which I haven’t done yet. Cheers. tks for this info..any idea what this box set is worth?? I would say, in good condition, it is worth between $120 to $150. Hi i just picked one up off Ebay last night for £62 in excellent condition. Hi Alan – well done! That sounds like a very good price for a copy of this box set in excellent condition. Hi – I havethis collection too that my Father bought for me when it was first released. 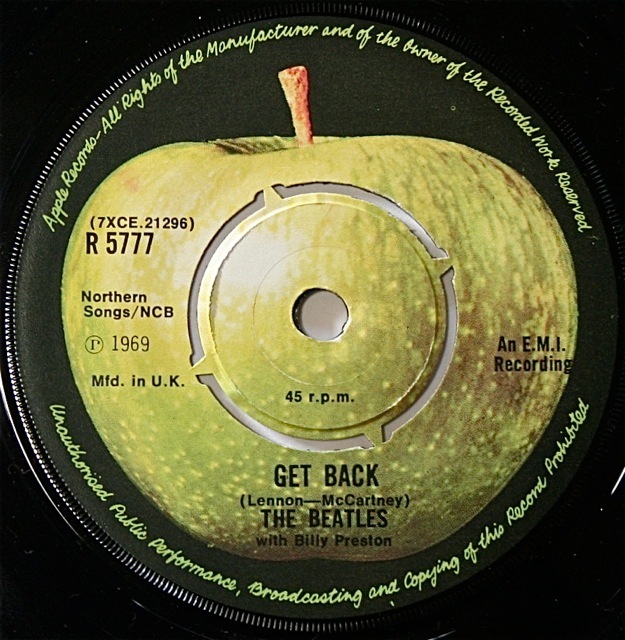 The B side of Get Back should be ‘Don’t Let Me Down’, but is actually a Wings song ‘I’ve Had Enough’. Is this the same for your collection? 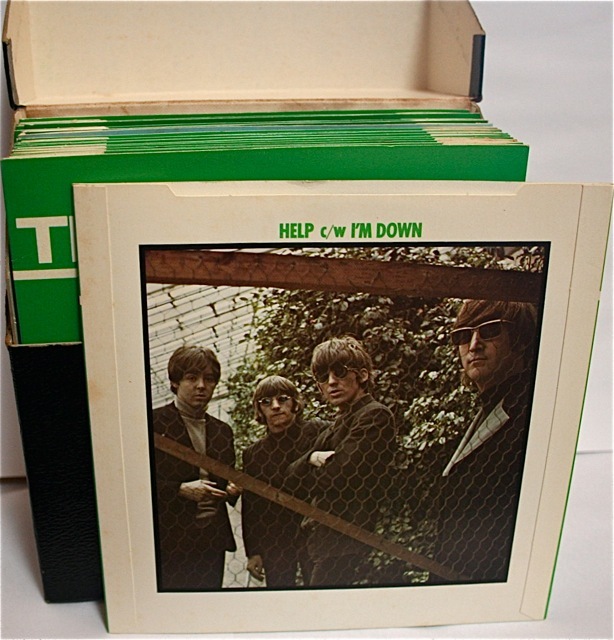 Hi, No – I checked and it says “Don’t Let Me Down” and it plays “Don’t Let Me Down” on my copy – which is the British release. Hi, im from Mexico, one person is sale to me this boxset in $ 500.00 dls, is it fine or its too high that price ? Hi Salvador, This is a very nice set to have in a collection, but I’d have to say that sounds VERY expensive for this item. I just saw one sell on Ebay for about US$105.00 (not including postage). It was not a mint copy, but it wasn’t all that bad. Hope this helps. 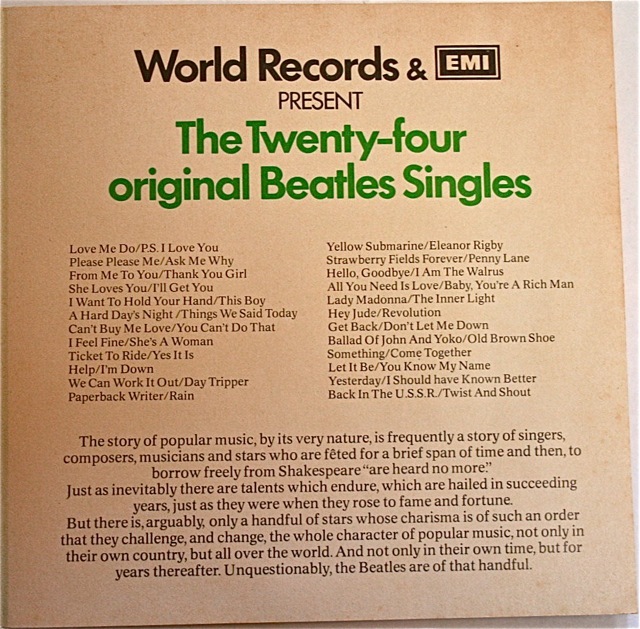 I also have the World Records 24 singles box set with the mispressing of Get Back/I”ve Had Enough – the Wings song in place of “Don’t Let Me Down”. Any idea of the value of this mispressing? Hi Yolanda, I think a specialist auction is the only way you find out what the worth of this collection is. Hi i read your blog beacause i just saw a copy on ebay for 11.55 as a buy it now. However the picture is of one of the records in front of the open box and theres 92 in stock. Do you think this is the entire box set or just the one single? I’d read the description VERY carefully as it sounds like this could be for just one of the discs, although if it is pictured in front of the whole box set then they may be selling that…..but this is not that likely especially if there are “92 in stock”. Even if they are saying there are “92 in stock” of the one single then this sounds odd as well. Hmmm. Perhaps a message to the seller to ask for clarification is in order. I have the exact same one. It’s my mum’s Though but think it’s so cool. My mum bought her’s 30 years ago and the box has a little wear and year but its definetly an awesome collectors item. In mint condition it would be worth heaps but is never sell it it’s way too awesome. That’s cool. Hang onto it and enjoy it! The box is very nice I didn’t know that World Records also issued this set. 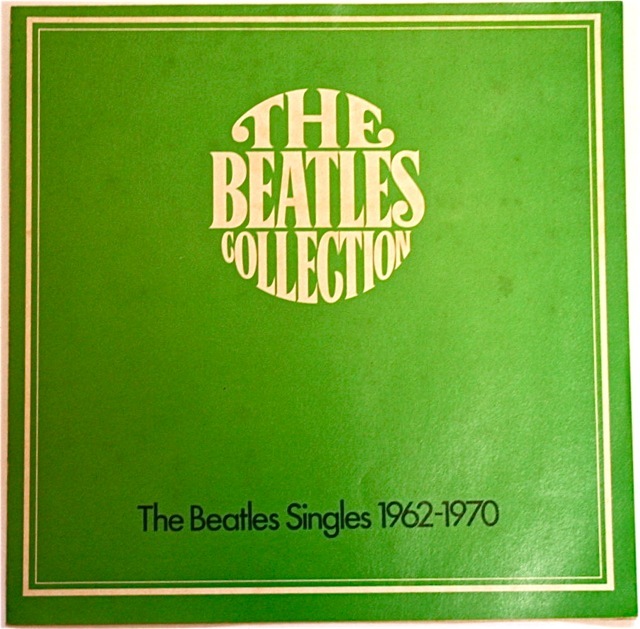 Hi I just bought this boxed set today for $115 in Bungendore NSW and am very pleased to find this thread as the set isn’t listed in my “Bible” The Beatles Album File & Complete Discography by Jeff Russell among his listing of British releases. So I was keen to get the details about it and check that its a real set not a fake. The discs in the set appear in excellent cond but the box has some damage on the lid hinge. 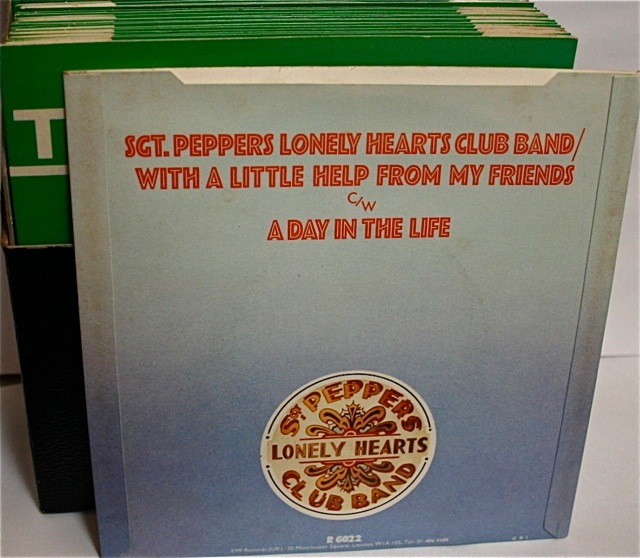 This has the 25th (Sgt Peppers) disc but doesn’t have the one page note you refer to, it does have the 4 page one though. I am gob smacked to get this for my collection as the chances of coming across this again is very low. Sounds like a really good price for that boxed set! Well done in finding it. I love it when that sort of thing happens. Whereabouts in Bungendore did you find it? 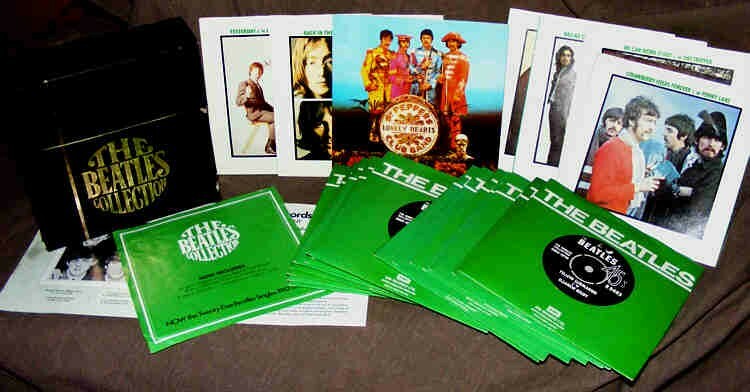 I bought this same box set when I lived in Liverpool for about 3 months in 1978. I’ve been trying to determine the value. Any idea? Hi. 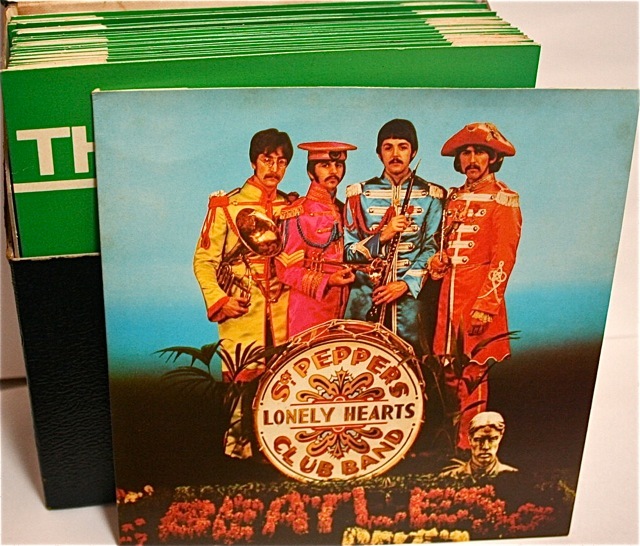 I have this box set, with a lift off lid & with the Sgt peppers disc. 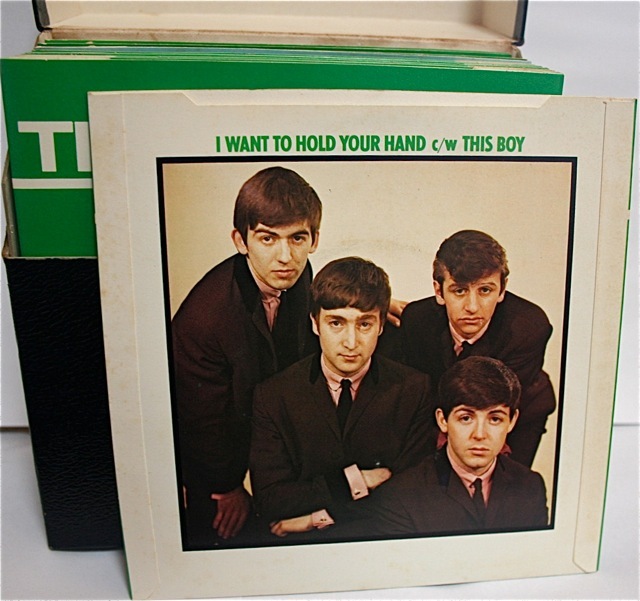 It has Made in Gt Britian on each Green sleeve, but it’s a NZ Pressing I think, by EMI. 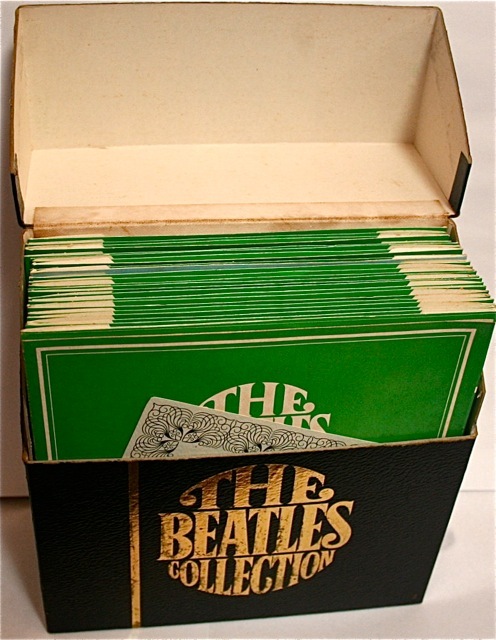 None of them have been played & the box is also in perfect condition. If you know anyone who wants to buy it. I’m happy to start negotiations, as I’m ageing and ill, I need to empty my collecting from years gone by. Hi. 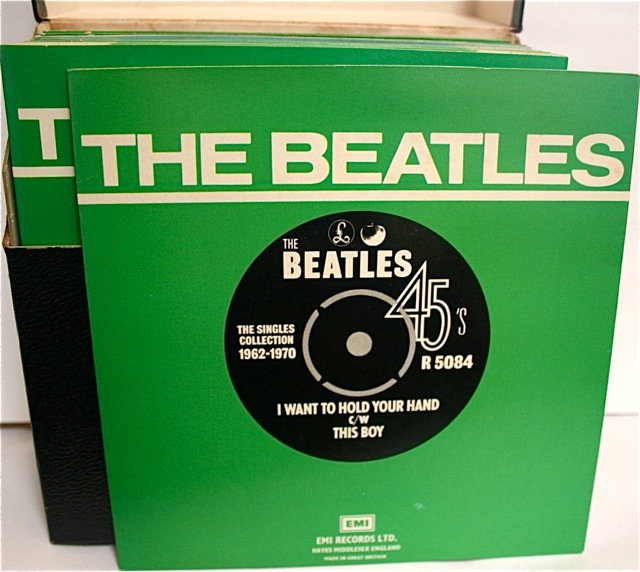 I too have this 45rpm box set, with a NZ PRESSING I BELIEVE? It has the parlyphone label & all 45 are black. The box has a lift off lid. & both 45,s & box are in unused condition. If anyone wants to buy this, I’m old and ill & need to move on a lot of collections. 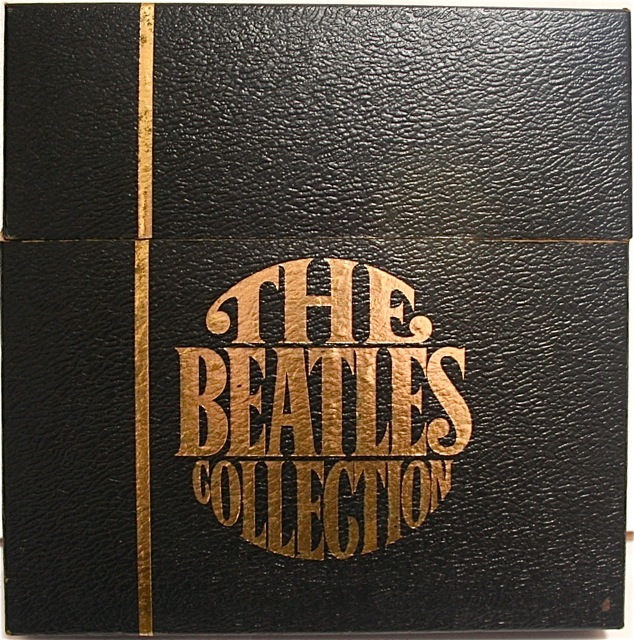 This Beatles box set being one of them. I do also have every LP they released. Any interested parties can contact me at misaroyd@gmail.com to start neg. I’m happy to reply to anyone & post worldwide. Any idea what a set would be wirth today? My husband has a set. And might be interested in selling. I have this too, mine also has Wing’s on back of Get Back. If it not a valuable collectors item I am thinking of suing them for not getting “Don’t Let me down” one of my all time fav’s.